With the change in patterns of innovation, construction plans have also changed to incorporate more intimacy within four walls of your house. It is from this notion that the conception of kitchens which is one of the most cornered spaces has taken a revolutionary turnover. The idea of closed kitchen space is now becoming obsolete with new flats in Kolkata for sale opting for an open kitchen plan. The question is how such a plan is preferable and beneficial? It has been a recurrent problem that the one to cook has always been separated from his or her family, friends or guests. The open format allows you to interact with your dear ones while you are busy cooking. Instead of being cornered into a different room, missing out on the fun, the open format allows you to prepare your gourmet meal while successfully playing out the role of the host. Again, if you have children at your place, you will also be able to monitor their activities. With Aspirations residential complex in Kolkata, you are empowered with multitasking! 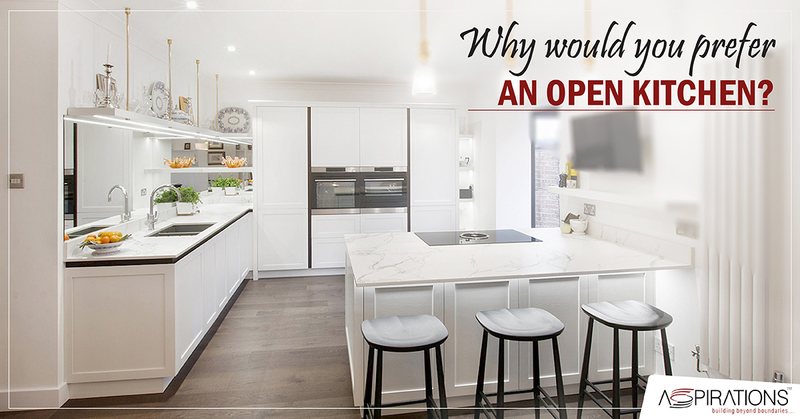 Life is easier with open plan kitchens. The dining space remains connected with your kitchen giving you direct and seamless access. Serving dinners to your family, friends or guests becomes easier and hassle-free. This again prevents food spills and accidents. An open planned kitchen has no hidden corners, unlike a closed planned kitchen. Cleaning becomes easier with such planning. Since it’s a continuation of the same floor, such a design is optimised for maximum cleanliness with hygiene coming into foreplay. Running multiple errands together without missing out on precious family time is what everybody desires. Be it mending your child or cooking for your guests, these acts which seem so very different are now brought under the same plane. Get in touch with Aspirations flats in Kolkata for sale and explore the latest innovations.